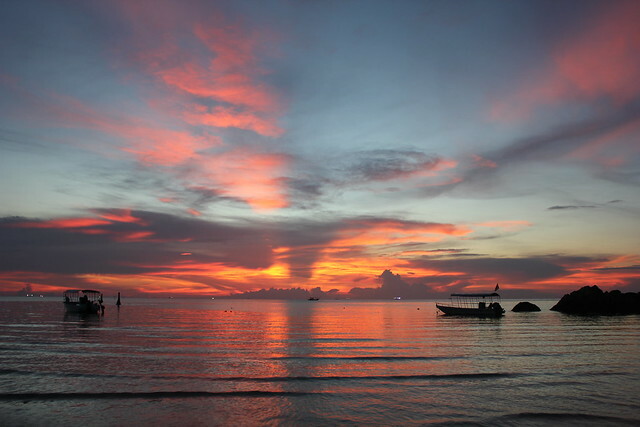 After a long day of travelling, I arrived on Koh Phangan on Saturday evening. For my first night I was staying near Thongsala, where the boat from Surat Thani arrives, so that I could get to my hostel easily and also to visit the Saturday night market along the main street. After checking in and a quick shower, I walked back along to the pier to check it out and try some yummy new Thai foods – I picked up some kind of coconut ball, pork satay, a spicy noodle sausage and some dragon fruit for a meagre 60 baht. Once back at the hostel I got chatting to a Spanish guy in my room and we had a couple of drinks before joining in with the beer pong tournament the hostel had organised. We pretty quickly lost and went for a wander along the road with a pack of dogs following us, as they seem to be everywhere in Koh Phangan. After bumping into some other people from the hostel we wound up in a salsa club for a bit of a dance before calling it a night. Considering Slumber Party has a reputation as a serious party hostel, it was quite a tame night for which I was definitely glad after a long day! The next morning I was up fairly early to move up north to Shiralea Backpackers Resort. My plan while being here was to get some serious relaxation in and explore a bit of the island, but as usual my plans never work out. 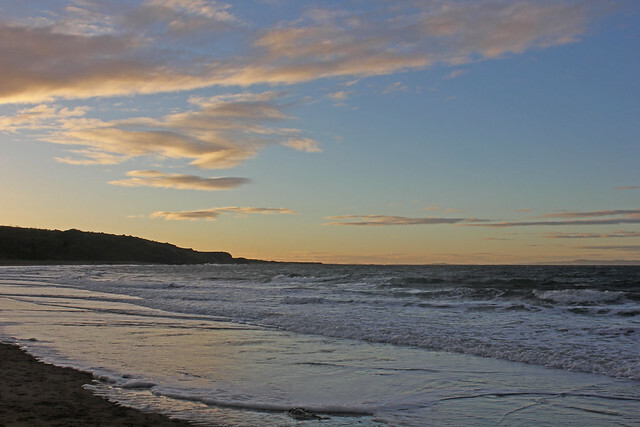 Admittedly when I first arrived it was dead quiet, and I walked the minute down the road to a totally stunning and almost completely deserted beach. After an hour there during which I got seriously sunburnt, I went to explore the area and maybe grab something to eat, only to discover it is pretty isolated and without a car or scooter there is almost nothing within walking distance, other than the more expensive beach-side restaurants. Feeling a little disheartened I made my way to the pool to read and write for a bit and got talking to two South African guys, a French man and two Scottish girls. The men had just arrived as well, but unlike my attitude to use the place to detox and relax, they were already enjoying a few early afternoon drinks. Eventually I gave in to their offers and so I got involved in what turned into a pretty messy (for them) and very fun night. The next morning I was up early for my first ever scuba dive! I was going with Reefers Diving who are conveniently located right next door to Shiralea, and we were heading out to Sail Rock, the best dive site in the Gulf of Thailand. After a quick drive up to Chaloklum, we hopped on the boat where we had breakfast and the two of us who were new to diving had a quick theory lesson. As we approached Sail Rock, the storm which had been lurking nearby all morning finally hit us, but as we were about to get under water it didn’t matter so much. We spent some time going over the basics again in the water, learning the four simple skills, and getting used to breathing from the tank. We then had an hour long dive which was just mind blowing. Sail Rock is one huge coral reef and I was just in awe the entire time. The highlight for most people was seeing a whale shark, but honestly just being down there and swimming amongst all the weird and wonderful fish was the best bit for me. After the hour, we surfaced and had a break for lunch and then went down for another hour, by which time I was feeling way more comfortable and confident and we were able to really explore the coral reefs. To top off the amazing day, I went to watch the sunset on the beach when I got back down and it was easily one of the most stunning ones I’ve ever seen in my life. Seriously fantastic day. The next day I was up early as usual, got in a nice bit of yoga then caught up with my French friend over breakfast. He was planning on exploring some more of the island on his scooter that day and invited me along so I figured why not? After a quick coffee stop in Thongsala we spent the whole day driving all over the place. 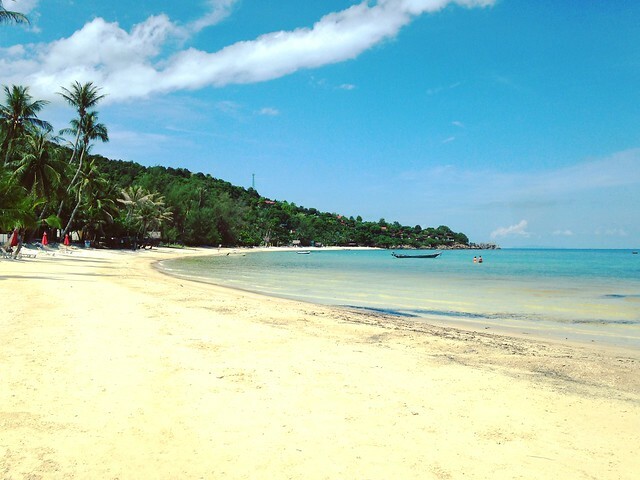 He’d been coming to Koh Phangan for years, so showed me some of his favourite spots, we took refuge from a storm and had a mid morning cocktail then a delicious lunch at Jip Shop, where I had the best Thai curry ever next to a talking bird and a baby rabbit, visited a friend of his at his boxing gym come stoner cafe (weird place) and just generally had a really nice day exploring and practising each other’s languages. The idea when I came back was then to have dinner, a couple of drinks and an early night, but it ended up being more than a couple of drinks and waking up in the middle of the night with serious food poisoning. Having been up all night being sick I was feeling pretty rough the next day. But my lovely Spanish friend Raul from my first night at Slumber Party had planned another day of island exploration, and I had to move hostels anyway, so the utter babe that he is, he came to pick me up and we had a really lovely day together. Our first stop was the national park where we hiked up past the waterfalls to the most amazing view point and had the picnic lunch we’d brought and then sat and chatted for an hour or so. From there we went to the (not so) Secret Beach, and even though it was a bit overcast it was still lovely, and exactly what I needed when not feeling my best. Easily my favourite part of the day though was learning how to ride a scooter, so I drove us back to Thongsala where we came across a night market and had our dinner from a few of the stalls there. 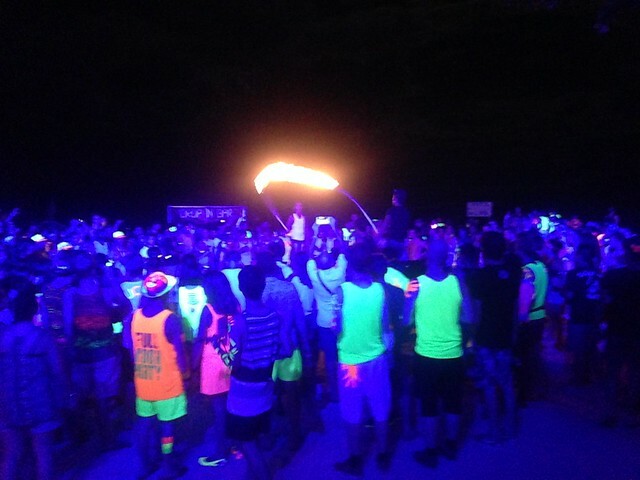 As we were both moving down to Haad Rin that night, we then had to make our way further south and already the party atmosphere was building with songthaews packed with neon clad backpackers. My amazing Spanish man drove me down on his scooter and we were subjected to a very stern faced drug search en route. Arriving in Haad Rin was surreal after the past few days spent in other parts of the island, and honestly the second I arrived I already wanted to go back. When I got to my hostel, that feeling only worsened. Finding the Zoo Hostel was hard enough, as only the bar and tattoo studio actually have signs. So I asked at the bar, where I was signed in and led down an alley behind the tattoo shop to a dark room. When I asked which of the tightly packed together beds was mine the guy had no idea, but as most were filled with sleeping bodies it seemed a safe bet to show me to one of the empty ones before leaving me there in the dark with no further information. Great. There was barely room to move, let alone a place for me to put my things, and it’s a good thing I’m fairly slim because even then it was a struggle squeezing between the beds to get up to my bunk. With the full moon party the next night and still feeling pretty rough from my fun filled night of food poisoning, all I wanted to do was get a good night’s sleep. My arrival seemed to wake everyone up though and it turned out they were all power napping before heading out to the Jungle Party at midnight. I felt pretty lame staying in on my first night at a new place, but I knew it was that or miss out on the main event the next night. But I got to briefly meet some of my 13 roommates before they headed out, and with the place pretty much to myself after that I was able to get some sleep. The next morning I was up early as usual, but was definitely on a different sleep pattern to everyone else in the town, for whom it seemed normal to sleep all day and stay up all night. I had a quick walk around Haad Rin to get my bearings and went down to the beach for a spot of sunbathing, by which time a few people had emerged including a guy from my hostel in Bangkok, so we caught up over some food in the hostel bar – which turned out to be one of the only good things the place has going for it. After getting food poisoning from my beloved pad Thai, I needed a little break from Thai food and the Zoo Bar was able to provide a damn good burger at the best price in the whole of Haad Rin. To be honest, there isn’t much to do or see in Haad Rin, so I wiled away the day on the beach. Around me the party was getting set up and people were already starting to drink by the late afternoon. Most people from the hostel didn’t want to head out to the party until a lot later on, but everyone from the Shiralea hostel was out earlier than that so we had a nice little reunion. I decided not to start drinking until later on so I could pace myself, and to be honest after seeing the buckets of booze I was slightly put off the idea all together. The Zoo Hostel was giving us a free one along with neon body paints, so I made my way back to get my full moon party look on, and then just wound up going back to the Shiralea crowd for the rest of the night. 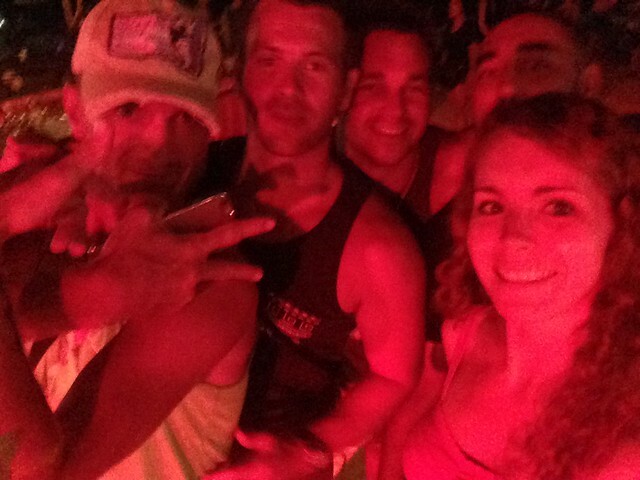 Admittedly I’m not huge into partying; It was a fun night but by no means the highlight of my trip. And when the torrential rain started around 1am I decided to call it a night! Next morning I was up before some of the others had even made it back. According to the map there was a view point about a 15 minute walk from the hostel, and I thought I’d go and check it out. Instead of a quick stroll, this turned into me getting lost in the jungle for an hour and a half, adding to my already numerous injuries, and almost being completely stranded. But it was worth it for the amazing views from the top and I discovered a much nicer beach around the other side from Haad Rin. When I eventually made it back some of the others were emerging in various states of hangover or still drunk and a few of us caught up over lunch. The rest of the day was super chilled out, and Haad Rin itself felt like a ghost town. I was supposed to stay another couple of nights, but with most people leaving that day or the next, me and another of the guys decided to move to a different hostel back at Thongsala to make it easier to catch our ferries in the morning. The next morning we all checked out and jumped into one of the many Songthaews loaded with people getting out of there. 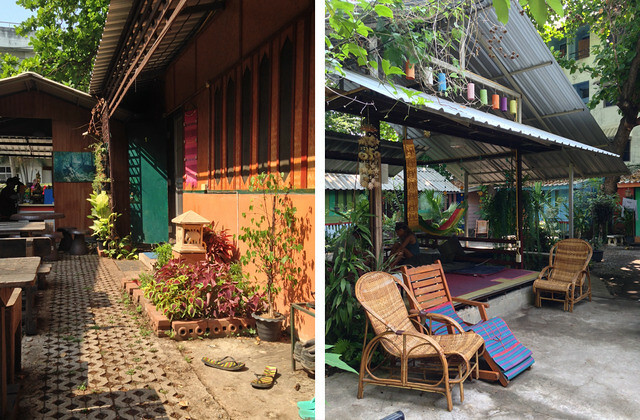 The hostel we moved to was supposed to be The Majestic, but it seemed to be the same place or taken over by Phangan Arena and was a completely different vibe from what we were expecting. But it was cheap and it wasn’t in Haad Rin, and that was all we really cared about! It was another really chilled out day. 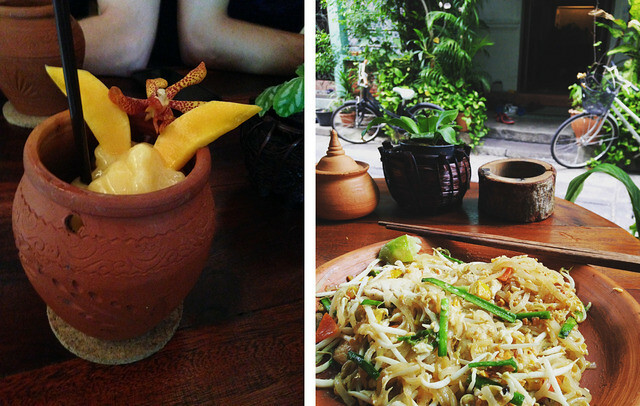 We grabbed some lunch and had a wander into Thongsala, a quick visit to Wat Pho, which after the temples of Bangkok and Chiang Mai was hugely disappointing, and a final visit to the night market for my last ever mango sticky rice. I was hoping to get a decent night sleep but the hostel had some pounding bass music playing until about 3am – not ideal. As nice as it was to be back in Bangkok, it was mostly just for being back at Born Free, and especially after being in Chiang Mai I didn’t much fancy spending the day in a big city. 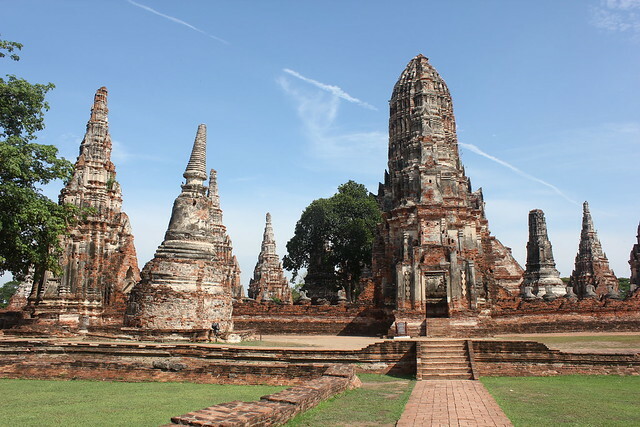 So I figured I’d go check out Ayutthaya instead. 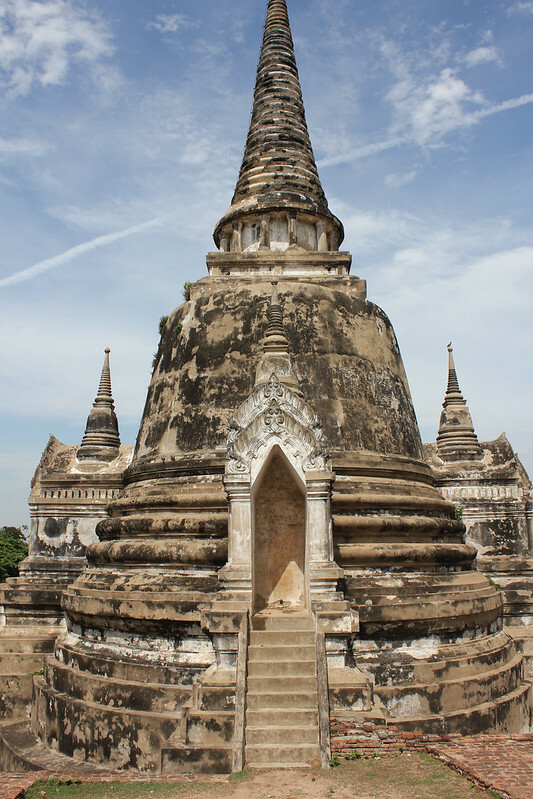 The former capital of Siam, it was once a city full of ornate, grand temples until the Burmese burnt the whole place down. Now all that remains are their charred remains and it is a UNESCO world heritage site. It can be reached from Bangkok by train for only 15 baht 3rd class and takes around 2 hours, so I aimed to get on the road quite early. The previous evening Kevin had advised me which bus to take to the train station, but typical Bangkok busses they are not the most reliable. I have learnt that on the quieter routes you generally won’t have to pay, as it’s not worth their while to employ someone to take tickets – but it is equally not worth it for them to stop and let you on if they just don’t bloody feel like it. So after 2 busses passed me by without even slowing down, when a scooter taxi approached I figured I didn’t have many better options. After negotiating him down to 60 baht from 100, I hopped on. Luckily when I arrived a train was leaving in 10 minutes, and getting my ticket was really easy. 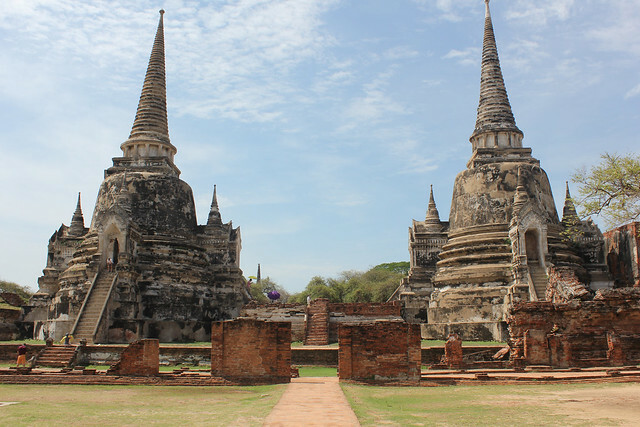 Two painfully slow hours later, we pulled in to Ayutthaya station, and after a quick 5 baht boat ride across the river into the main part of the city, I was finally there. I was having serious mango sticky rice cravings and also badly needed some caffeine, and there was a huge market as soon as I got off the boat for me to get my supplies for the morning. 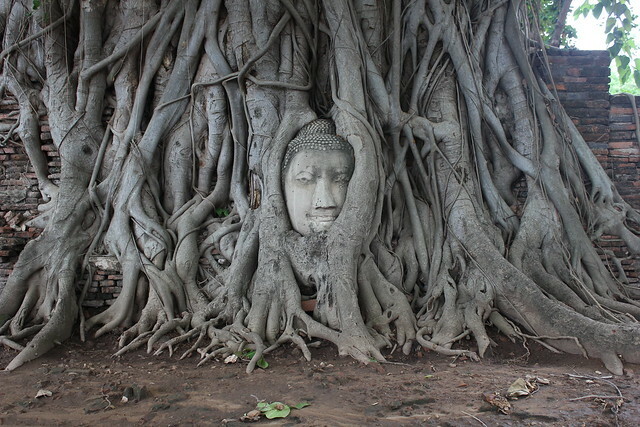 My first Wat of the day was Wat Mahathat, best known for the Buddha head in the tree, and it was only about a 20 minute walk away. I’d heard it was best to rent a bike or scooter to get from temple to temple, but I thought I’d start off walking and see how I went. Admittedly they are a lot further apart than they look on a map, but equally there are only so many you can see in a day. As stunning as they are, they are also quite similar in many ways seeing as it is just their remains. After Wat Mahathat I grabbed some cheap and delicious pad see ew for lunch and then walked through the park to the main temple, Wat Phra Si Sanphet, admiring many of the others along the way. 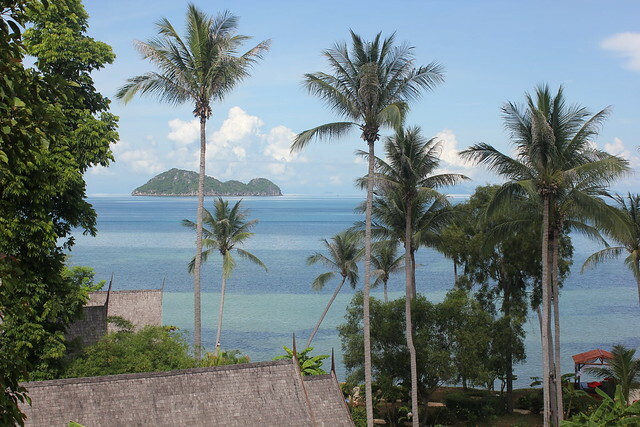 From there I headed off of the island to Wat Chai Watthanaram down in the south west of the city. That was definitely quite a walk, and one that took me through some real local living. After a look around there it was getting quite late in the afternoon and I was contemplating the best way to get back on to the island and basically to the complete opposite side of the city. I overheard a couple of guys speaking English and asked if they knew a quicker route back, and they said they could give me a ride back in the songthaew they had hired for the day – success! They let me out at their hotel in the middle of the city and from there it was a quick walk and the wee boat back to the train station, where I got my ticket – and was told there wasn’t another train for over 2 hours. While I could have gone to see another temple, I was pretty much Wat-ed out at this point, so I went in search of somewhere for dinner and a drink instead. Most of the places around he station are quite touristy, yet still decently priced, and I had a surprisingly nice green Thai curry for only 60 baht. The train journey back felt even longer than on the way there, not helped by the woman selling food who walked up and down our carriage shouting in the most annoyingly screechy voice the entire time. I then had a similar issue of getting a bus back to the hostel, and it took another age for to find the bloody bus stop and for one to actually arrive. This time I was taking no chances as I could see it wasn’t slowing down, so I pretty much planted myself in front of it in the middle of the road, and that seemed to do it! All in all it was a good day and I’m so glad I went, but it was fairly tiring with the amount of travelling involved in the space of a day. If you have time it’s probably best to stay over night, or if you do it as a day trip check the return train times when you arrive! 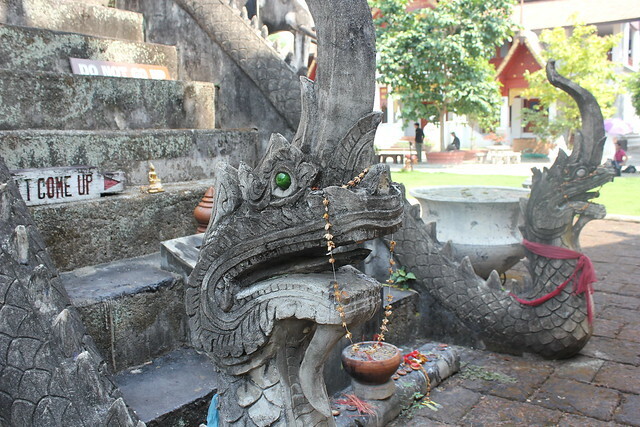 My arrival in Chiang Mai didn’t exactly fill me with positivity, but I could not have been more wrong about the place. First off, I chose to take the shuttle bus for 40 baht rather than a taxi for 300. This is a shared mini bus service, which will only leave once ten people are on board. When I bought my ticket and this was explained to me, the woman said we were just waiting on two more after me, and as I was paying two guys also came up to buy tickets. This was clearly a lie though, and we then had to wait around 45 mins for enough people to get going. The airport is only a 15 minute drive from the old city so this was slightly frustrating. So by the time I arrived at my hostel it was last afternoon. My first impression of Mojito Garden also wasn’t great. It felt an awful lot like camping. A series of bungalows, which were basically garden sheds, surround a kind of central relaxing area and there is a separate toilet and shower block. It’s super basic, but I guess you get what you pay for. The weird thing was how deserted it was and that the few people that I did try to make conversation with were very antisocial – strange for a hostel. Not to be put off though, I left my things and headed out to the Sunday Walking Street. 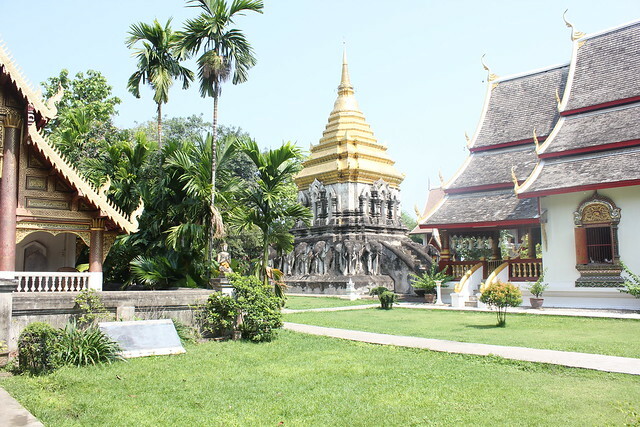 The old city of Chiang Mai is relatively compact and the one good thing about Mojito Garden is that it is very central, meaning most things are within a 5-10 minute walk. Every Sunday, the main streets of the old city become a sprawling market place. As the late afternoon sun slowly began to set, I spent a leisurely couple of hours browsing the stalls, picking up wee bits of street food here and there, listening to some of the surprisingly good live music (and some of the less good), shopping, and just generally soaking up the atmosphere. Even just after this short time I was already in love with Chiang Mai, and it was such a nice change to being in a big city. I’d been hoping some more people may have been around when I returned to the hostel, but it was still deserted. Equally the staff were not in the least bit helpful, and when I enquired on how to get to Doi Suthep, they hardly even knew what I was talking about. The following morning it was still dead, and the staff were equally as unresponsive. A free breakfast was supposed to be served between 8 and 11, but at 8:15 there was still no sign of anyone. Eventually someone stumbled bleary eyed through the garden, and when I asked about breakfast he seemed surprised and said he could do it in 10 minutes. I have to say though, what I got was pretty damn good so that kind of made up for it. 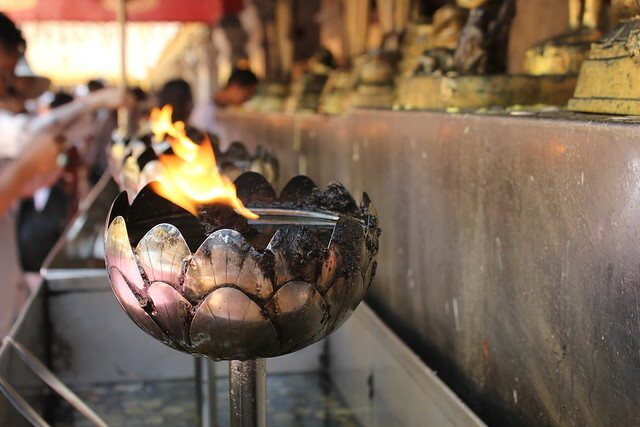 My plan for the day was to visit the temple at Doi Suthep and then hopefully do some walking up in the mountains. The cheapest way to get up there is by Songthaew, which cost 50 baht per person and leave just across the road from the North Gate. It’s the same kind of system as the airport minibus, in that you need to have 10 people for it to go. When I got there, a group of three Canadians were also waiting so I got chatting to them. After a while another woman joined, and the driver said if we paid 100 each we could go now. Not wanting to waste the day and it still being extremely cheap, we went with that option. The drive up the mountain takes about 40 minutes, and in the back of a truck I imagine the windy road may not be for everyone! Wat Doi Suthep sits at the top of the most ornate 309 steps I have ever climbed, flanked on either side by beautiful green and gold dragons. 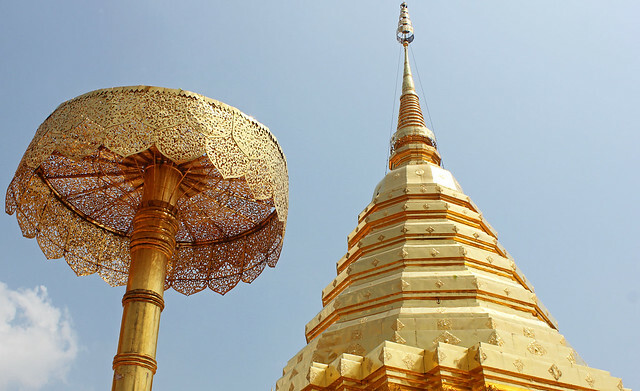 Once inside, the temple itself is stunning, a gold beacon shining on top of the mountain. It doesn’t even feel that much like a tourist attraction as it is a working temple, and the majority of people actually seemed to be there to worship. We each took part in some Kau Cim fortune telling which was pretty cool. 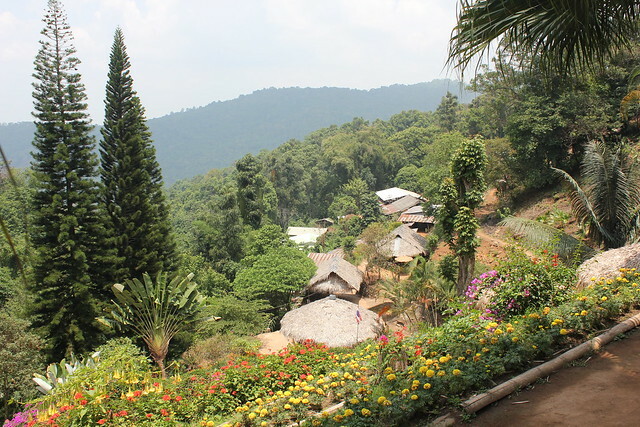 After the temple, the Canadians wanted to go out to a hill tribe village where they grew coffee. It was about 6km up the mountain, so we hitched another lift on a songthaew and figured we would walk back from there. In the village itself there wasn’t a huge amount to see, though it was still interesting and there was a gorgeous flower garden and small waterfall which could be visited for 10 baht. After that we grabbed some lunch in a small cafe and tried some of their locally grown coffee, which really was delicious. Although the walk back to the bottom of the temple was along the road, it was quiet enough for it to still be enjoyable. 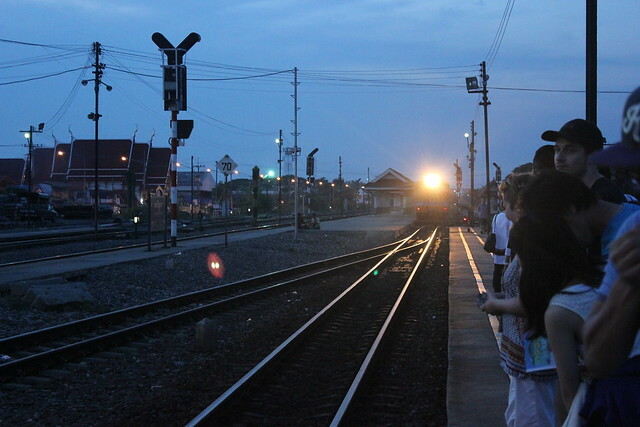 We got there just in time to catch one of the last songthaew back down, and got out at Chiang Main University to go to a temple around there. 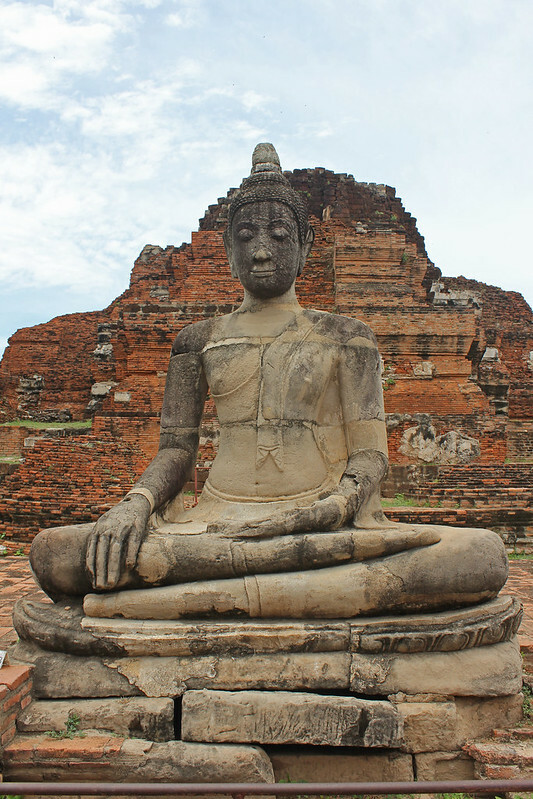 Every Monday to Friday from 5-7pm, the Wat Suan Dok runs something called Monk Chat. It’s an open session where anyone can go in, sit with the monks and learn about Buddhism. I had mentioned it to the Canadians that morning and they were also interested, and I’m so glad we went. It was such an open, honest, and fascinating two hours, and felt more like a lesson in philosophy than religion. From there I dragged the poor guys the last 2km home, and safe to say when we got back we were all pretty exhausted, but what an amazing day. 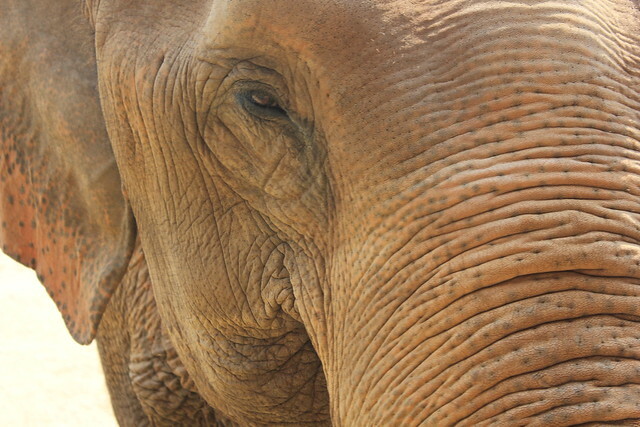 Day 2 in Chiang Mai was one that I’d been looking forward to for a long time – spending the day at the Elephant Nature Park looking after rescued elephants. 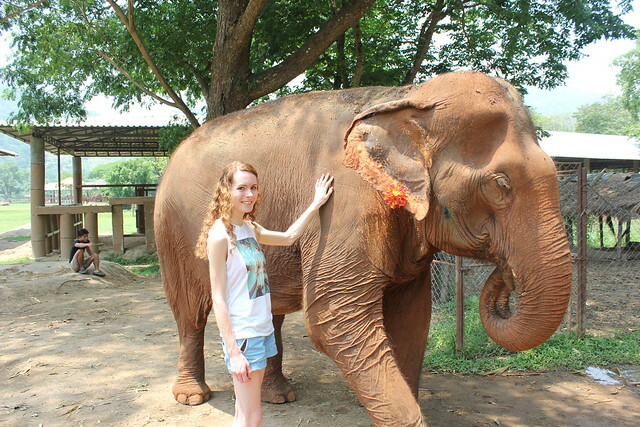 They take in animals which have been abused, such as elephants used for tourism, illegal logging, or forced breeding, and rehabilitate and look after them. It’s one of the only places in Thailand to do so in actual humane conditions, so if you want to see elephants when you’re here, this is the way to do it. I was picked up from my hostel and my group was made up of another 6 people, plus our guide for the day Sai, who was fantastic. When we arrived they provided tea and coffee while telling us what the day would involve, and then our first thing was feeding time. There were many groups there, and as an elephant wandered each group got to feed one. After an entire basket of fruit and veg, which to her was probably just a light snack, she had had enough. We then got to walk around the park and meet the different ‘families’. The elephants themselves choose their companions and then generally stick together, so there were mostly groups of two or three, but a few who were either newer and hadn’t made friends yet or were simply more solitary and preferred spending most of their time by themselves. After that it was time for lunch, which was one of the best meals I’ve had here. It was all vegan Thai food, with a massive hot and cold buffet to choose from. After lunch, everyone headed down to the river to see some of the proper families, the ones with babies. For this we had to keep our distance as the mother and the nanny in particular are very protective of the baby, and the herd as a whole keep it surrounded a lot of the time when they are walking. But we got to watch a couple of different families, one with a 1 year old and the other a 5 year old, as they played and cooled down in the river and then ate some more. The guides were all super helpful in answering our questions, telling us each elephant’s story, and you could tell they had a real connection with them. Finally, after a quick snack and some iced tea (for us) it was bath time. This kind of ended up being for both the elephant and us as we all got utterly soaked, but I’m sure she enjoyed being covered in muddy water more than the rest of us! When I returned to the hostel there were actually people there being sociable! I was pretty exhausted after two quite full on days, so it was nice to just spent the rest of the evening chilling out and chatting to some really sound people. After a while we decided to check out then night bazaar as everyone wanted to get some food, so we hopped in a songthaew. I’d been wanting to go there anyway but I was a bit disappointed. I think after the Sunday market it just felt quite touristy, over priced and inauthentic. Some of the others wanted to stay out for a drink but I needed some sleep and a couple of the other girls felt the same, so we walked back from there. Unfortunately I didn’t get any sleep that night, as the hostel staff were up until 6am drinking and talking right outside my room. From there we took a tuk tuk to the Warorot Market hoping it would be a bit better, but again it was more of a food, fabric and bric-a-brac kind of affair. We decided to give up and walk back into the city to see what we could find there and for some lunch, and this was really what we should have done in the first place! Chiang Mai surprisingly has some really cool and unusual shops, and we spent ages browsing a second hand book shop and a kind of fairy fantasy themed jewellery shop before getting lunch. After we’d eaten we were feeling pretty wiped so decided the best thing to do would be to go for a massage. The Chiang Mai Women’s Correctional Institution trains inmates within 6 months of their release in various skills as part of their rehabilitation, and one of them is massage. All of the money they earn through this they personally get to keep for their release, so you can feel like you’re doing a bit of a good deed as they pummel and knead you into a state of blissful relaxation. It was actually the first massage I’ve ever gotten but the girl who did it did a fantastic job on my sore, achy muscles. It’s a good thing it was only around the corner from our hostel, as we sleepily meandered back and pretty much all fell down in a dozy happy heap in the garden. Eventually we woke ourselves up enough to shower, and I headed back into town to see some more shops. After a day of hunting for them, the first stall I came across had the exact trousers I’d been looking for and I successfully managed to barter them down to a much cheaper price. When I got back I returned to our garden hang out where the French guys were already chilling after their day with the elephants. Alice had to fly home that evening but Irma joined us as well and after a quick drinks run to 7/11 we stayed there the rest of the night drinking and chatting, while various other people stopped in and out. Really it wasn’t anything special, but it’s the people that make things enjoyable and it wound up being a perfect last night in Chiang Mai. I still had most of the next day however, as my flight back to Bangkok wasn’t until the evening. 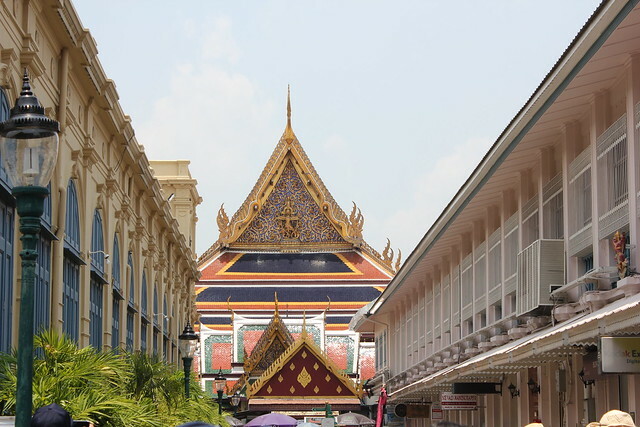 I’d originally intended to see some more of the temples, feeling kind of bad that I hadn’t properly checked out a few of them after a quick glance during the Sunday Walking Street. But the night before, the French guys Pierre & Benjamin had said they were going to rent some scooters and head up to the waterfalls of Doi Suthep National Park, and frankly that sounded a hella lot more fun. So my last day in Chiang Mai was spent riding around the mountains, playing in waterfalls, and hiking through the jungle. The path we took for our hike clearly hadn’t been used for a while and we had to forge our own way a lot of the time, resulting in some minor injuries on my part as I attempted to scale a fallen tree. But at the bottom we were rewarded with a tiny stall selling bags of delicious plums, and to add a bit of protein to our snack, Benjamin found some red ants on a tree, and adamant that they tasted like lemon insisted that we all try one. And yes, they actually did. 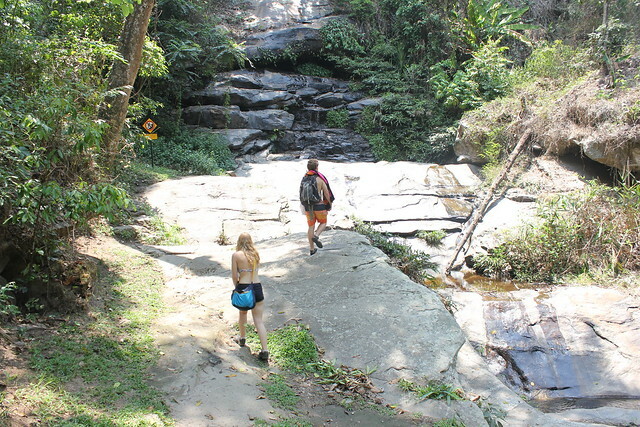 On our way back down the mountain we stopped off at another waterfall for some cliff jumping off the rocks surrounding the pool, which was heaps fun, but then it was time for us to go so I could catch my flight. Getting back to Bangkok and Born Free felt nice and familiar, and I was warmly greeted by Sam the receptionist and Kevin the owner. My first stop was naturally their cafe for a massive plate of pad thai, and then Kevin invited me to join him and his friends for a drink at a local bar, the Cinema Winehouse, which had decent wine, great live music and lovely staff. Eventually the exhaustion set in though, and I had another early start the next morning, but all in all a pretty fantastic day. If I had to sum up Bangkok in two words after my first three days there, they would be dirty and fun. I left Scotland to 2•c and the threat of snow, but as I stepped off the Sky Train at Phraya Thai in Bangkok the wall of heat and humidity hit me hard despite it still being early in the morning. After about 5 minutes of walking in it, I started to seriously regret my decision to walk the 5km to my hostel to ‘stretch my legs’ after 20 hours of travelling. 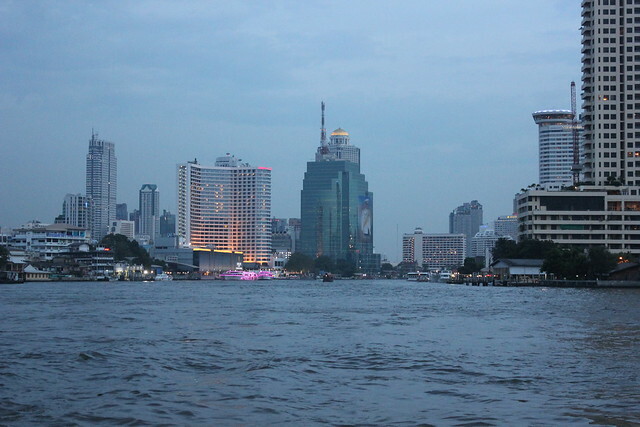 I also quite quickly discovered that walking across Bangkok is nothing like walking around a city in Europe. The place is crisscrossed with highways 10 lanes wide, and if you try to take a short cut or a quieter street to get away from the traffic you easily get lost, end up at a dead end, or walking through someone’s home which has spilled out into the street. And so after many wrong turns and dragging my batter suitcase through some slightly unsavoury neighbourhoods, I finally stumbled into my hostel two hour later, a sweaty, sleep deprived mess, possibly still slightly drunk from the plane. While in Bangkok I was staying at the Born Free Hostel on Samsen Soi 6, which is about a 5 minute walk from Khao San Road, so is practical but in a slightly less loud, touristy area. When I arrived it was too early to check in, but I was thankfully able to leave my bags and have the best cold shower of my life. My first thought after that was to go and find some real food after one too many plane meals. On the long walk over I had passed so much delicious smelling street food so that was the plan, but typically on wandering out of my hostel I couldn’t find anything that looked even halfway decent. After getting to grips with the neighbourhood I thought I’d head towards the Grand Palace and find something to eat on the way. 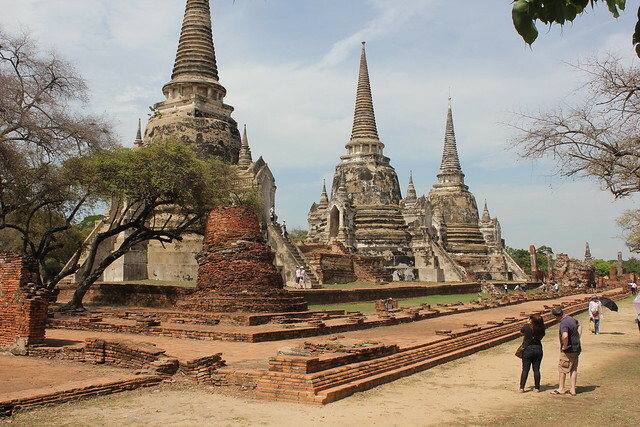 I was finding Bangkok fairly difficult to navigate, and while trying to find the place I bumped into two Austrian and two Canadian girls who had all also just arrived and were just as lost. We joined together and managed to find the complex which it sits in, and after passport checks and making sure we were adequately covered up we were allowed in. From there it was about a 20 minute walk to the Grand Palace itself, and only once there were we all told that we were still inappropriately dressed and forced to buy clothes to cover up more. I am now the less than proud owner of an ‘I ❤️ Thailand’ t-shirt. 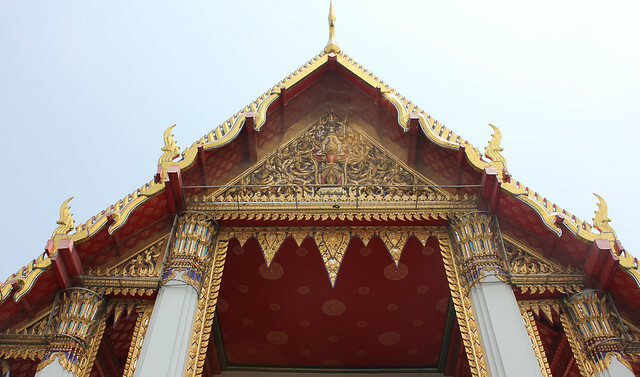 We had a look around the outside, which in itself is beautiful, but all of us opted not to pay to get in to the temple itself as we were all hungry, tired, and figured we would come back and see it properly when we felt more up to it. 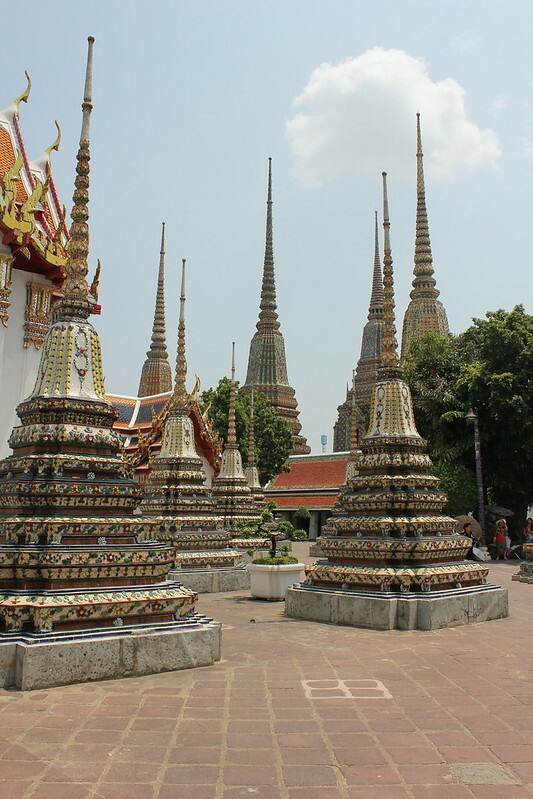 The plan from there was to finally get some food, but as we were leaving we realised we were night next to Wat Pho and that we might as well check it out while we were there and had the necessary cover ups. I have to say that despite all of us feeling awful it was definitely worth it and I’m glad we went there instead. 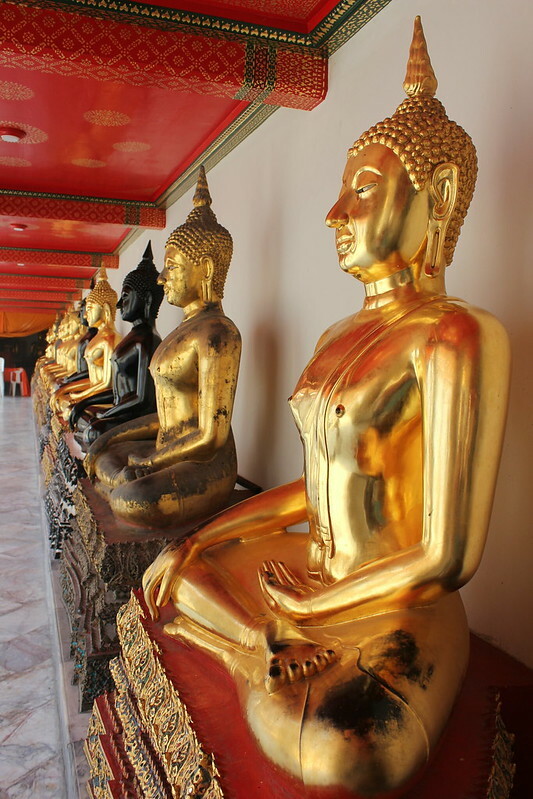 Wat Pho is best known for being the home of the giant Reclining Buddha, but everything else there is equally as impressive. 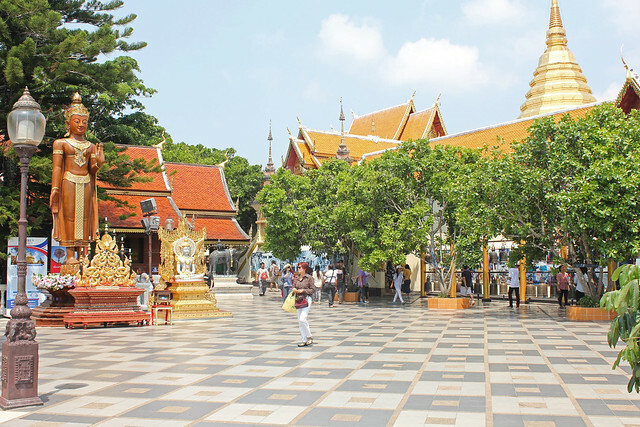 The grounds with the mosaic encrusted buildings sparkling gold in the sunlight, all the small temples, the hundreds of Buddhas, it really is something special. We were even invited to listen to a monk who was giving a casual conversation in one of the shrines we entered. By this point we had lost the Canadians, and me and the Austrian girls were really feeling the combination of heat, hunger and jet lag, so we decided to call it a day and went back to our hostels. After another glorious cold shower I set off again with determination to find some food, as well as a place to sit and write my journal. But while looking at the food in one place, I saw some guys sitting outside a bar bartering over scorpions on a stick and, well, I had to watch them eat it. They asked me to join them for a drink and luckily there was a guy across the road making pad thai, so I grabbed some food, ordered a large G&T, and watched them bravely eat scorpions. The verdict – tastes like chicken skin with a very bad after taste. It turned out they were all new in Bangkok as well and the girls were even staying in my hostel so we figured we’d all spend our first evening together. The girls wanted to go back and change, but me and the guys then spent the rest of the night bar hopping around Khao San Road, Rambuttri Road, and some of the small streets near my hostel, where we found this great little cocktail bar. As for Khao San Road itself, I have to say I don’t love it. It’s a laugh, and worth checking out, but if you actually want to be able to speak to people? Not a chance. It’s loud, it’s in your face, and we all had a much better time a time some of the other places we found. Eventually the jet lag kicked in for all of us though, and after a fairly impressively 60 hours awake, I finally got some sleep. After an amazing 10 hour sleep, I woke up the next morning feeling so much better and apparently not feeling the effects of jet lag! Without any real plan in place, I was just chilling in the lounge area of the hostel and started chatting to 3 guys who were staying there. We were all feeling the need for food, and they said that the hostel’s cafe across the street does the best pad thai ever. And it really does. Their smoothies were also amazing, and feeling much better (and a lot fuller) me and one of the guys decided to borrow the hostel’s free bikes and go for a quick cycle. I don’t think either of us counted on this becoming an 8 hour bike ride but hey. I’m in 2 minds about cycling in Bangkok. On the one hand I’d say it’s the best way to get around. The city is almost completely flat and it’s big enough that walking isn’t always an option (and that’s saying something coming from me!). But the streets themselves aren’t the nicest for cycling. As I said before, it’s either massive highways or bumpy back streets, and it’s an every man for himself kind of deal in terms of safety and right of way. I wouldn’t let that put you off though, as long as you’re a confident cyclist it’s heaps fun. We had a bit of a strange day in terms of what we actually saw. Originally we set out without a real plan, then chose to go to Lumphini Park. By the time we got there we were hungry (again. As someone who doesn’t usually eat much I seem to constantly be hungry but also spend most of my time eating. Definitely coming back a stone heavier.) Unfortunately there wasn’t much around in the way of places to eat, but we had just passed through a hospital and noticed it had a canteen so figured it was at least something. I went for the lighter option of a papaya salad, as we’d already had lunch but it was too early for dinner, and it was as average as can be expected from a hospital canteen. Although the milk teas we had made up for the food! Once we had refuelled we went for a cycle around the park, where we had a close encounter with a rather large monitor lizard who was just chilling by the stream, saw some cute wee turtles swimming about in the lake, and then were told that you weren’t allowed to cycle in the park after 3pm. Why, I couldn’t quite understand, but we were literally told to get on our bikes. Another idea we had had was to see Wat Arun from the boat at night when it’s lit up, so we set off in the rough direction of the river. On our way there we were passing down an alley where some really nice looking food was being cooked, so stopped for another quick bite and I finally got to try Thai sausages. Pretty damn good. We got to the boat stop and after a long time trying to figure out how the system even worked we were told that for health and safety reasons we couldn’t take our bikes on the boat. Bit rich considering where we were, but as much as we pleaded it was a solid no. So with no choice but to cycle the rest of the way back, we grabbed a couple of beers and found a spot by the river to see the temple from – only to discover that it wasn’t lit up. Still, it made a nice break from sitting on a bike seat all day and sometimes it’s nice to just sit and watch the city go by. The remainder of the trip back wasn’t actually that long, as getting around by bike here is actually really quick, but it was still 9:30 when we made it to the hostel. That probably would have been a good time to go to bed but instead I wandered out to meet the guys from the night before for a couple of beers. Afterwards they moved on to Khao San Road, and after two minutes in a club there it cemented my opinion that the place really isn’t for me and I headed back for some much needed sleep. 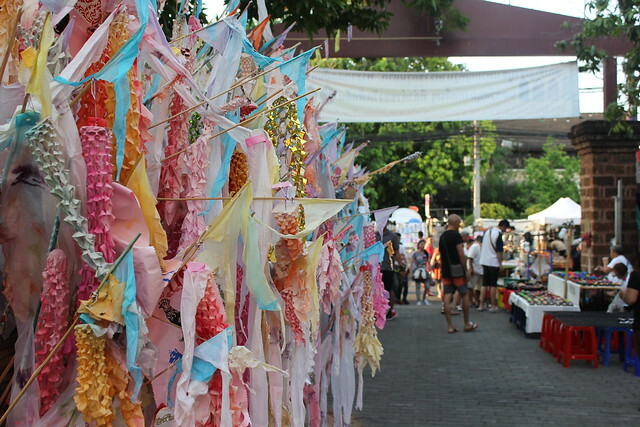 Despite going to bed at 2am the night before, I managed to get up early on Saturday with plans to go to the Chatuchak Weekend Market. This meant negotiating the Bangkok bus service, which still confuses and frustrates the hell out of me. Another reason bikes are better. 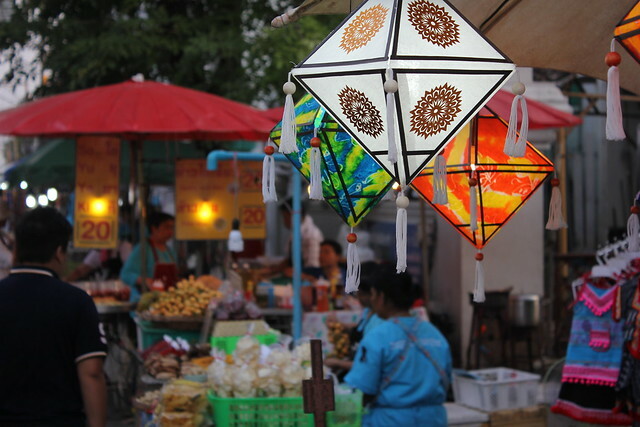 The market is huge; It spreads over 35 acres with more than 8,000 stalls. I didn’t have anything in particular I wanted to buy apart from maybe some clothes and breakfast, but it is fun just to browse as you can buy pretty much everything there, whether it’s tacky souvenirs, art, or a pet squirrel. I got some mango sticky rice and a fresh lime juice for a bit of fuel and then spent the next couple of hours wandering the stalls. 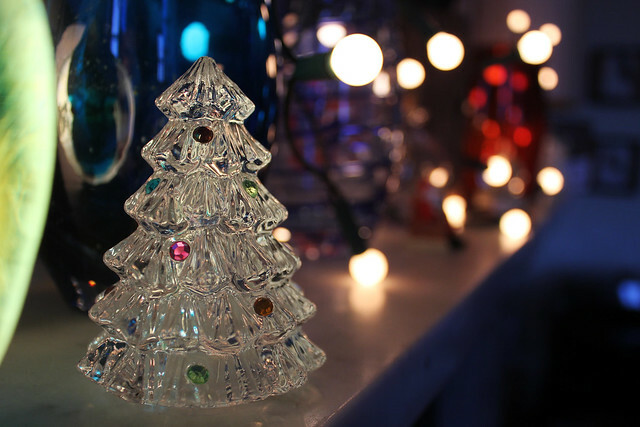 Even after that long I was sure there were things I’d missed, but it was getting to midday and the heat in such a crowded space started to become unbearable. Once I’d got back to the hostel and showered again, I was getting some serious cravings for the pad thai from across the street so headed there for lunch. And somehow it was even better than the day before! I spent a couple of hours just relaxing, reading, writing & making travel plans, but after a while was itching to move. Admittedly there wasn’t anything in particular I really wanted to do, so when one of the guys said he was going to the market I just tagged along for something to do. It probably wasn’t the best idea. Having to sit on the bus again, this time in heavy traffic, and then the torrential rain started. 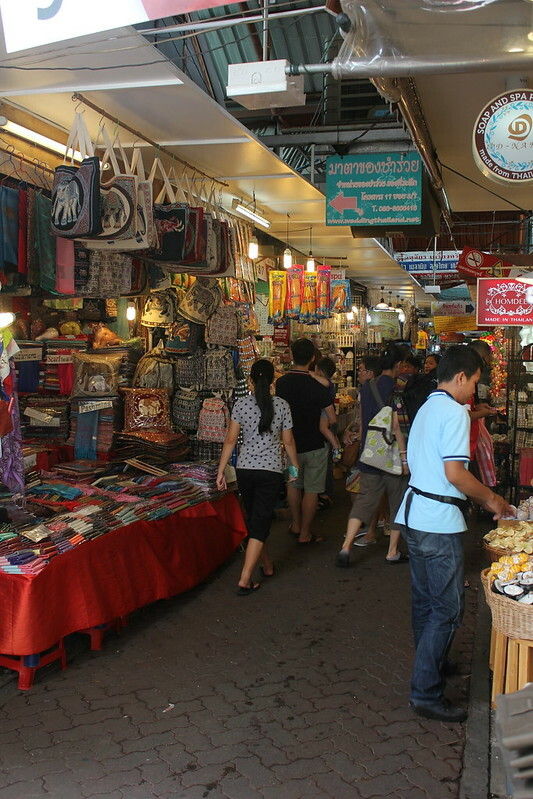 By the time we got to Chatuchak, the lanes between stalls were more like rivers and half of the market was inaccessible. We had a quick browse but it was pretty miserable, though we did get some coconut ice cream to make it a bit better. Turns out it was a localised rain storm as well and if we’d stayed near the hostel would have missed it, but oh well. My plan for the evening was to just stay in, relax, and get a cheap dinner somewhere, but inevitably with hostel living plans never get stuck to. I got talking to a guy who had just arrived in Thailand and wanted to try some good Thai food. My first choice was the cocktail bar I visited on my first night, but we were too early for food so just went to the Born Free Cafe instead. As much as I’d have loved another of their pad thai, I felt like one a day was enough and that I should branch out, so had a Pha Ngan curry instead, which was also really good. Afterwards he wanted to see what Khao San Road was like, and two very young girls from his room wanted to come too. Having not ever wanted to go back there, I somehow found myself spending another evening on that street, but called it quits at 9 and came back for an early night, slightly wishing I had just spent the evening by myself. I’d been lucky in the people I met my first days as we got on really well, and had kinda forgotten that not everyone you meet in hostels will be your type of person. Still it was sad to leave the place the next morning, although I decided to come back for my very brief stay after Chiang Mai. Overall, Bangkok was a lot better than I expected. Yes it’s a big, car filled city, and you never quite feel clean there. But once you accept that, it has so much to offer and something for everyone – great food, friendly people, fun bars, stunning temples, and endless shopping opportunities to name just a few. I’ve only just left but I’m already looking forward to coming back. I realise I’ve been a bit quiet on the blog front since the New Year, but now that Winter is finally over it’s time to come out of hibernation. And with perfect timing, as three weeks today I’m off to Thailand for my first travel adventure of 2017! 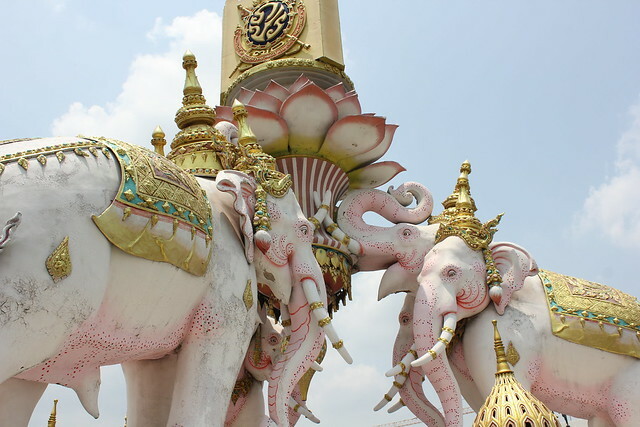 Starting in Bangkok for a few days, I’ll then head North to Chiang Mai for some jungle trekking, temples, and a visit to an elephant rehabilitation sanctuary. 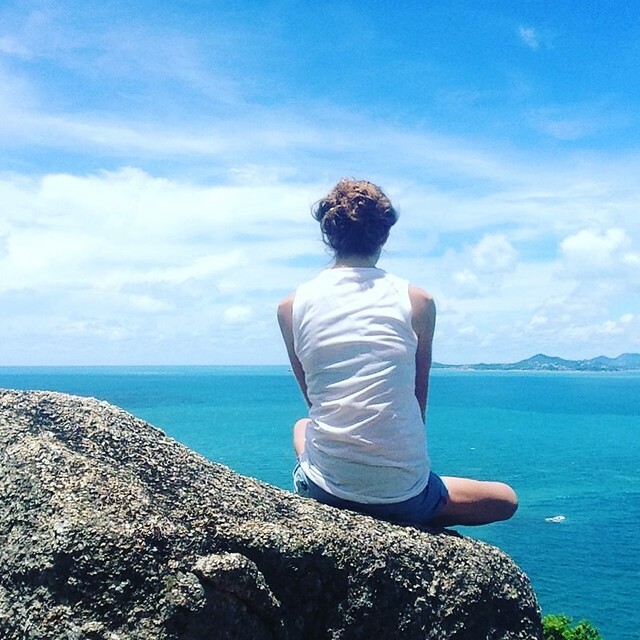 After another brief stop over back in Bangkok, it’s down South to the islands for relaxation, yoga, and of course the Full Moon Party. 2016 came to an end and so this project does too. I’ll mostly likely do a new one for 2017 and actually commit to updating this when I’m supposed to this time!